During Thanksgiving weekend the Johnson family eats pie for breakfast, as an afternoon snack, and for dessert after dinner. We are passionate about pie. At my wedding there was no wedding cake. I was more interested in wedding pie from Zingerman’s. 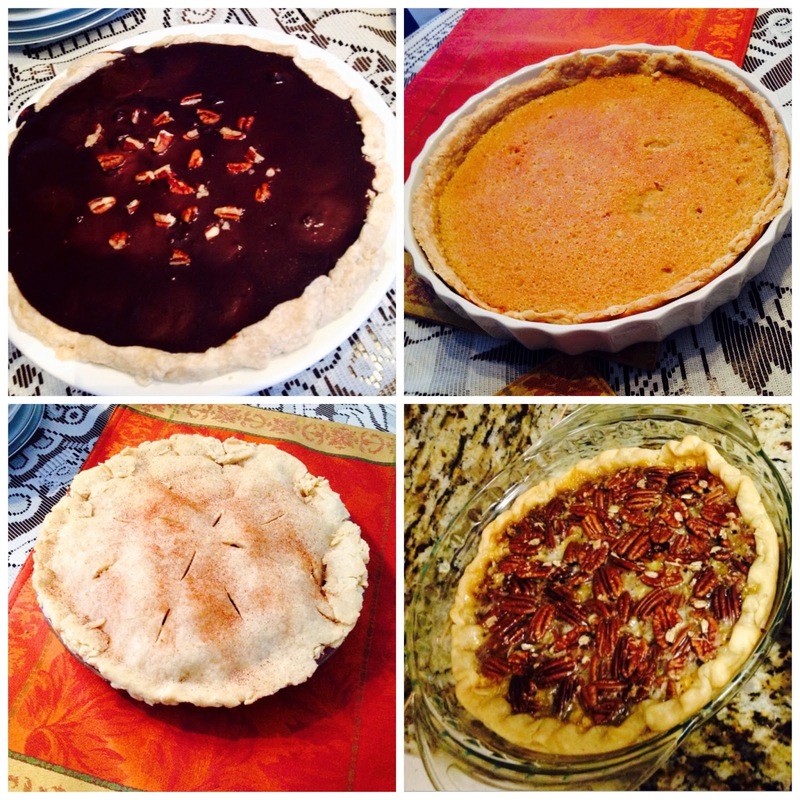 This Thanksgiving we baked Pumpkin Pie, Oatmeal Pecan Pie, Apple Pie, Blueberry Pie and Chocolate Banana Cream Pie. We also made a Johnson family specialty…Vinegar Pie. For the first fifteen years of my life I was a Vinegar Pie skeptic. Vinegar in a pie sounds gross. My mom finally convinced me to give it a try when she described it as a pecan pie without the pecans. Vinegar Pie essentially is a sugar pie. Nobody seems to know why the recipe calls for vinegar, but we add that tablespoon every time. It’s about time I blog Grandma Johnson’s Vinegar Pie. 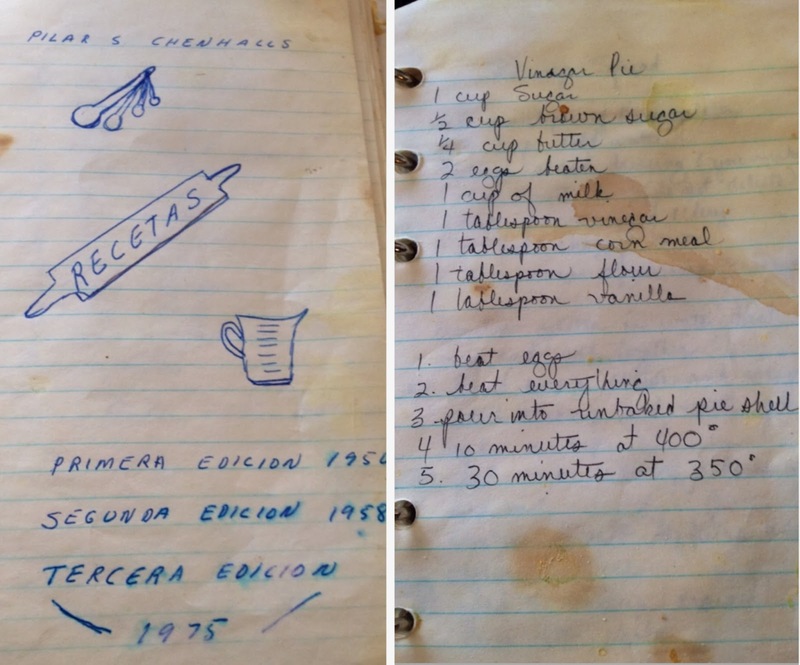 I dug out the recipe in Mama’s old cookbook. Give it a try this holiday season! 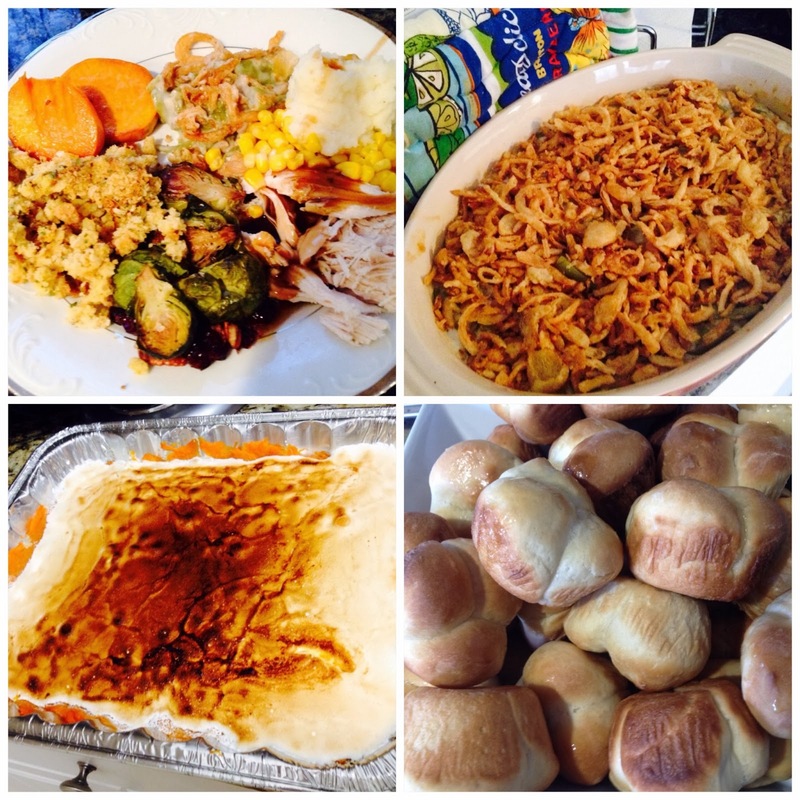 I have also included some of my Friendsgiving and KIPP Potluck photos. Quick tip: Next time you make sweet potato casserole, use marshmallow fluff. Your vegetarian friends will thank you and if you bake then broil it, the marshmallow will make a delicious crusty layer. Living off of blended foods for the week after I got four wisdom teeth pulled turned me away from smoothies. I have tried to get into the whole green smoothie fad as a way to pack in the leafy greens, but I am just not a smoothie person. This Runner’s World recipe, for example, had been hanging on my fridge for over a year. It even has chocolate! I finally blended it up last weekend after a run. Although it is not packed with spinach and kale, the protein from the greek yogurt and antioxidants from the cherries help reduce inflammation after a tough workout. The Black Forest Blizzard is the smoothie for non-smoothie lovers, tasting more like a light milkshake. I’m still working on drinking my greens, and finally blending up this Black Forest Blizzard is a step in the right direction. If anyone has green smoothie recipes that will convert me, send them my way! 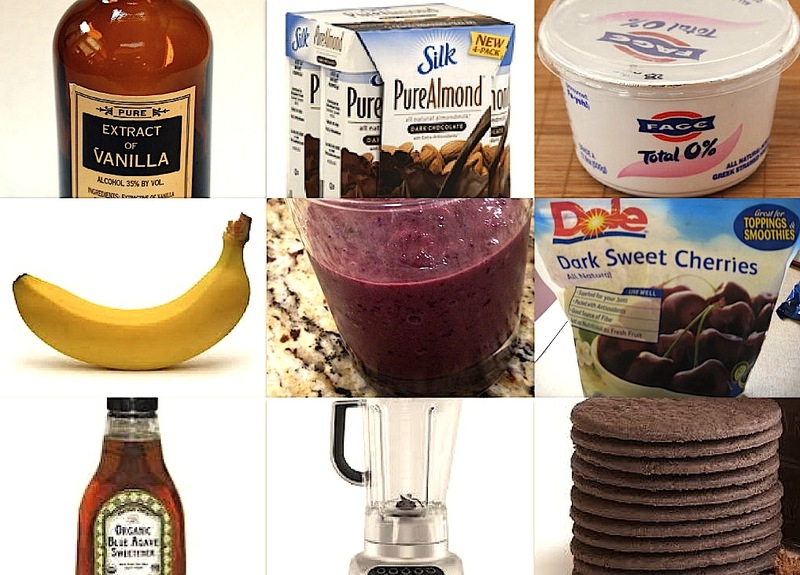 Combine all ingredients (expect the wafer) in a blender. Blend until smooth and creamy. Top with crumbled chocolate wafer. It’s time for a cookie recipe! 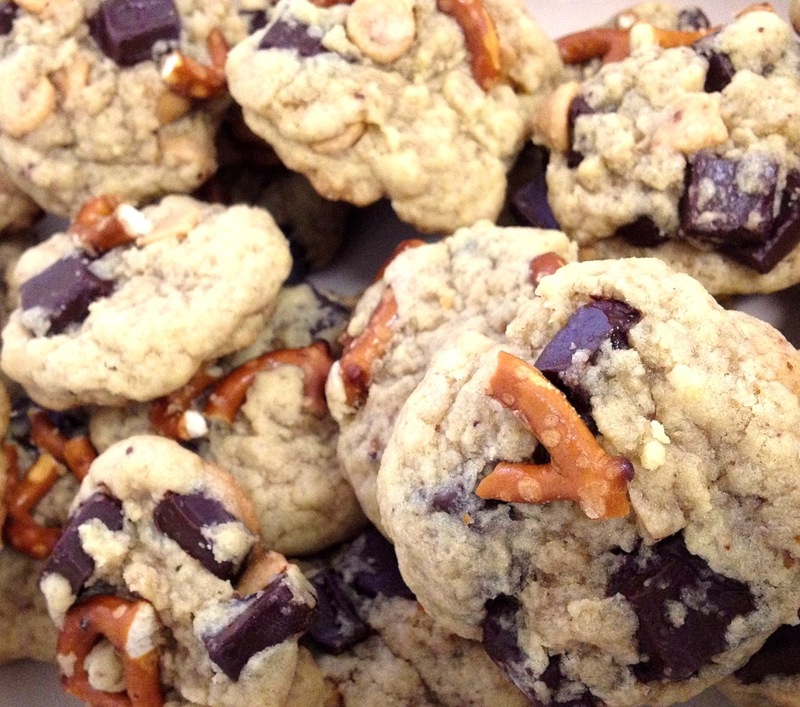 Dark Chocolate & Peanut Butter Chip Pretzel Cookies have great texture and a nice balance of sweet & salty. They are best right out of the oven, with gooey chocolate and peanut butter chunks and the crunch of broken up pretzels. I made them for a friend’s labor day barbecue, and sadly there were none left over 😦 I guess I’ll have to make more soon. I’m thinking of mixing a batch, roll the dough into tablespoon balls and freezing them. Homemade cookies in less than 15 minutes anytime I want, with no extra dishes to clean, and no need to bake the entire batch. Yum! In a medium bowl, mix together the flour, baking soda, and salt. Set aside. In a larger bowl, beat the butter and sugars together on medium speed until light and fluffy (about 2-3 minutes). On low speed, slowly add the vanilla extract and egg. Beat to combine. Add the flour mixture and beat just until there are no more streaks of flour. Carefully stir in the chocolate chips, peanut butter chips, and broken up pretzels. Cover and refrigerate for an hour, or freeze for 15 minutes. Preheat the oven to 350F. Line baking sheets with parchment paper. Scoop out well rounded tablespoonfuls of the dough. Leave about 2 inches between each scoop. Bake for 10 minutes (11-12 if you like crispier cookies.) Cool cookies on the baking sheet for a few minutes before enjoying.